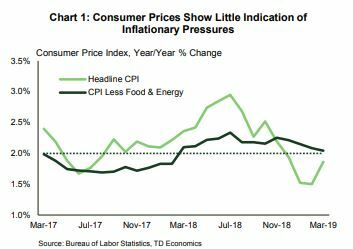 Inflation pressures remain benign, as headline consumer prices rose just 1.9% year-on-year in March, and core prices came in at 2.0%.These numbers reinforce the Fed’s ‘patience’stance that was reiterated in its March FOMC minutes. US-China trade negotiations are progressing with China appearing to make further concessions on tech-related issues, and the two sides agreeing on an enforcement mechanism. Trade talks with the EU, however, are set to become more contentious as the U.S. threatens tariffs on EU imports following a ruling from the WTO on a longstanding disagreement. The U.S. economy continues to enjoy its Goldilocks moment – at least with respect to inflation. Consumer prices rose 1.9% year-on-year in March, up from 1.5% in February, largely driven by increases in energy prices (Chart 1). Core inflation came in at 2.0%, and while not the Fed’s preferred metric, is consistent with price pressures running neither ‘too high’ nor ‘too low’. 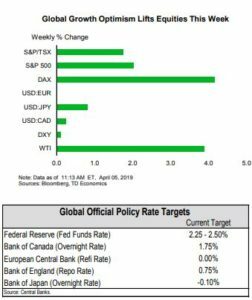 Several months of muted inflation readings have strengthened the Fed’s decision to keep rates where they are. Minutes of the March meeting showed that board members saw little in the data to prompt a shift in policy. 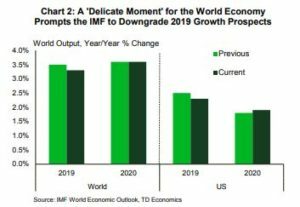 This rhetoric is expected to continue through the end of 2019, with signs of an improving labor market balanced against risks to growth from a struggling global economy. 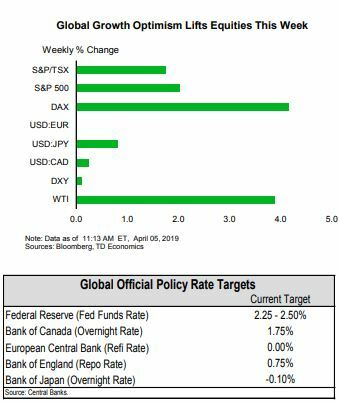 The Fed’s European counterpart (the ECB) on the other hand, while leaving rates unchanged this week, signaled that there could be substantive changes to monetary policy at their next meeting in June. With anemic growth among member countries and lingering policy uncertainty, it signalled a willingness to act to ensure a return of inflation to target and bolster the region’s faltering growth. On the trade front, relations with China seem to have taken a turn for the better, with talks between high-level officials ongoing. As cooler heads prevail in one trade negotiation however, disputes are heating up in another. The U.S. is threatening to impose tariffs on approximately $11 billion of EU imports. The threat comes after 14 years of litigation at the WTO over subsidies for European aircraft manufacturer Airbus, which America argues puts U.S. based Boeing at a disadvantage. The U.S. emphasizes that this move is independent of current ongoing trade talks with the bloc; but the timing could be seen as an attempt to gain leverage in those negotiations. Boeing for its part continues to deal with fallout from the grounding of its 737 MAX airliners. There were no commercial orders for the product in March, the first time this has occurred since May 2012. Boeing will reduce production of the jet starting mid-April, while it works to fix flaws with the model which resulted in two fatal crashes. If the production cut lasts to the end of the quarter, they could shave 0.1 to 0.2 percentage points off Q2 GDP growth. Internationally, Britain’s attempt to leave the EU continues to push past deadlines. This week the EU granted another flexible extension to October 31st for the UK parliament to agree to a deal. The gesture, however, came with strings attached, as the UK will have to hold EU parliamentary elections if they have not ratified the deal by the end of May or risk exiting without a deal on June 1st. Given these and other uncertainties, the IMF downgraded projections for global growth in 2019 to 3.3%, citing ongoing trade tensions and declining confidence (Chart 2). This brings their forecast in line with our own view published in March. 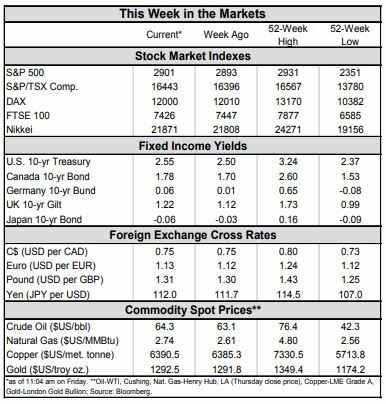 Growth in 2020 is expected to rebound to 3.6%, slightly above our expectation for 3.5% growth.